Join the Five Companions and prepare for the final confrontation with Molag Bal. I've been summoned back to the Harborage in preparation for our battle against Molag Bal. The Prophet will appear to you once are close to a major city. "The companions assemble once more. Travel to the Harborage; it is time for our final preparations." Once you arrive at the Harborage, you need to speak to Varen Aquilarios. He tells you that by defeating Mannimarco you have destroyed the Worm Cult's power forever. He offers to show you his visions of Mannimarco's eternal torture, if you want to confirm his defeat. 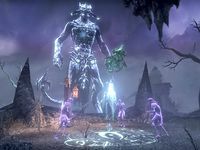 If you choose to watch the vision, you will see Mannimarco whipped by ghostly beings while Molag Bal watches. Varen expresses pity for him, then tells you that Sai Sahan wants to speak to you. "When Emperor Varen first brought the Five Companions together, he did so in the hope of creating a Tamriel where all men could live freely and safely under one banner. The Five Companions failed, betrayed from within by one of our own: the Worm King Mannimarco. All that came after was the result of one man's treachery. Now four of the five are reunited to right that great wrong. But destiny requires a fifth." Sai Sahan offers you the chance to become the fifth member of the Companions, an offer you can accept or refuse. If you accept, Sai Sahan will declare you the last and strongest part of the blade forged by the Companions' friendship and loyalty. Varen notes that you fulfill the Elder Scrolls prophecy: you are the brightest of five stars and will guide them to the dawn. "When the Planemeld has been thwarted and the dust has settled, the Five Companions shall gather one last time to face our destinies. The God of Schemes must be stopped, Vestige. That is the only thing that matters now." He gives you a reward. 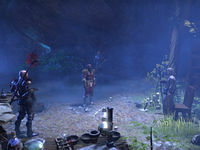 Unlike the other chapters in the Main Quest, which occur every 5 levels at the earliest, this quest had its requirement reduced from Level 45 to 40 in Patch 1.0.6, and can therefore be started immediately after Shadow of Sancre Tor. However, you may decide to wait until you are at a higher level, such as the quest's original level of 45, in order to obtain a higher level reward. Varen called me to the Harborage. His words carried a sense of finality. I should make my way there. I arrived at the Harborage. I should now speak with Varen Aquilarios and see what's on his mind. Varen Aquilarios has pulled me into his dream visions. I need to see what he wants me to see. Sai Sahan seems to want to contribute. I should speak to him. Sai Sahan is addressing the Five Companions. I need to hear what he has to say. Lyris wants to have a word with me. Lyris is addressing the Five Companions. I need to hear what she has to say. Abnur Tharn has something to say to me. Abnur Tharn is addressing the Five Companions. I need to hear what he has to say. Varen Aquilarios has some final words for me. This page was last modified on 19 July 2018, at 16:12.